Join "The Heart of Holiness: Finding Peace in the Love of God" a weekly small group series at various times and locations, beginning the week of March 10. On Sunday, February 24, Fr. Dan Leary joined us for a talk on finding inner healing during Lent. To listen to his talk, click here. Support our building project by purchasing a personalized memorial brick! Does your chili have what it takes to take home the blue ribbon? Join our Family of Faith program on Saturday, February 23 at Father Andrew White School from 6 to 8 PM for our Chili Cook Off! We still have a few spots left for Mount 2000, a Eucharistic retreat from February 8 to 10, 2019 in Emmitsburg, Maryland. 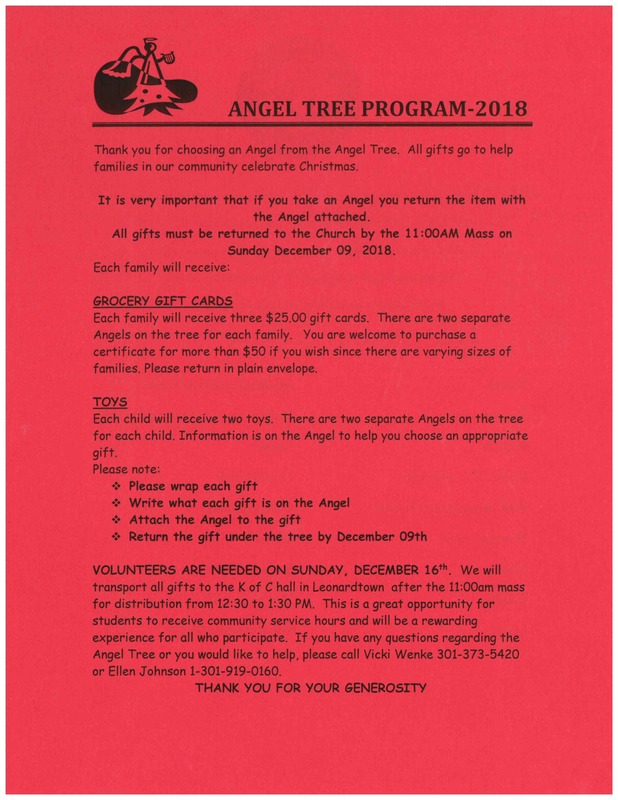 Our St. Vincent de Paul Society is once again organizing an Advent Angel Tree to provide Christmas gifts for those in need. This year&apos;s effort is in honor of Ella Neal, who organized the Angel Tree for many years. If you are in need of healing from physical pain, emotional loss, or spiritual guilt, you&apos;re invited to a Healing Prayer Service on Sunday, December 2 from 6:30 to 8:00 PM at St. Aloysius Church. The evening will include Praise & Worship, Adoration of the Blessed Sacrament of the Eucharist, readings from Sacred Scripture, the sacrament of Reconciliation, and an opportunity to pray with a healing prayer team. On Friday, November 16, 2018, Father Andrew White school students gathered with Fr. David Beaubien to see the cornerstone being laid in our new parish addition. Due to 100% chance of heavy rain, FRIDAY night&apos;s Back from the Dead cemetery walk is canceled. Saturday evening&apos;s event is still on. We hope to see you there! Saturday, September 29, join our parish St. Vincent de Paul Society for the Friends of the Poor Walk to call attention and raise awareness to the needs of the poor. Each year there is a post-walk brunch, live music, face painting and balloons for children, a silent auction, and door prizes. Why do we suffer so much in this life? What is the purpose and meaning of our trials? How can we find hope and healing amidst our sorrow? Discover how suffering can be a catalyst for our union with Christ in a 4-part series called "Real Suffering: Finding Hope and Healing in the Trials of LIfe." Are you interested in learning more about Jesus and the Catholic Church? Are you thinking about becoming a member of St. Aloysius Church? Join Deacon Joe Vavrus and Leonard Wathen for an informal 30-minute meet and greet on Wednesday, September 26 at 6:30 PM! This fall, the 177 Project is bringing an evening of Eucharistic Adoration and music to every diocese in the United States and St. Aloysius Church is hosting the event on September 23! The evening begins with a rosary at 6:45, followed by Adoration at 7, and a small concert at 8:15. The evening is free to attend but does require a ticket. 3RD PLACE at the Dragon Boat Festival! Congratulations to our Dragon Boat Team for earning THIRD PLACE in the Solomons Island Dragon Boat Festival on August 18!